The Suffolk County Police Department hosted a basketball clinic during which coaches volunteered to teach 12 to 15-year-olds. Brentwood, NY - May 22, 2015 - The Suffolk County Police Department hosted a basketball clinic during which coaches volunteered to teach 12 to 15-year-olds. Third Precinct Liaison Officer Jeanette Morales and School Resource Officer George Polities, along with other officers from the Third Precinct, hosted the event at the Brentwood Freshman Center on May 21. Basketballs, sneakers and hats were raffled off during the event. 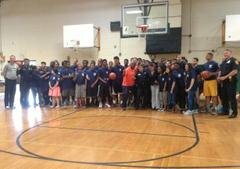 Subject: LongIsland.com - Your Name sent you Article details of "Suffolk Police Hosted Basketball Clinic in Brentwood"